It is happening in the UAE - yes it is! : @NBarDubai NAIL COUTURE STRAIGHT FROM L.A.
NAIL COUTURE STRAIGHT FROM L.A. This May, straight from L.A., Lauren B Beauty is getting ready to paint the city with a glamorous collection of couture nail products, exclusively at N.BAR.The first in the Middle East to launch Lauren B’s exclusive range of “five-free” polishes, N.BAR continues to set new benchmarks in the grooming industry with their exclusive range of eco and vegan-friendly products. Adding a touch of Hollywood glamour, the unique collection is both good for your nails and fashionable at the same time. Inspired by the latest runaway trends and perfectly created to offer long lasting glossiness and chip-free finishing for up to 2 weeks, there is the perfect tone to match your nail persona, leaving your nails looking as shiny and fabulous as ever. A gilded glow that looks warm and elegant, not frosty. And its sheer finish makes it unusually appealing on both pale and dark skin. The prettiest teal green – the effect is dazzling and playful, with a bohemian appeal that’s made for summer weekends. 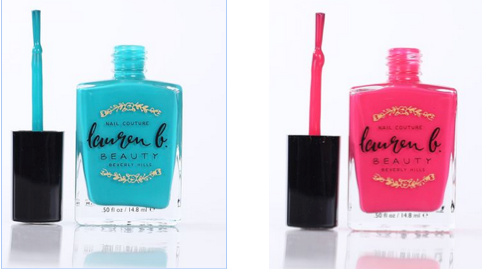 Prices for Lauren B products begin from AED 65. If you are looking for an excellent contextual ad company, I suggest you take a look at Chitika.